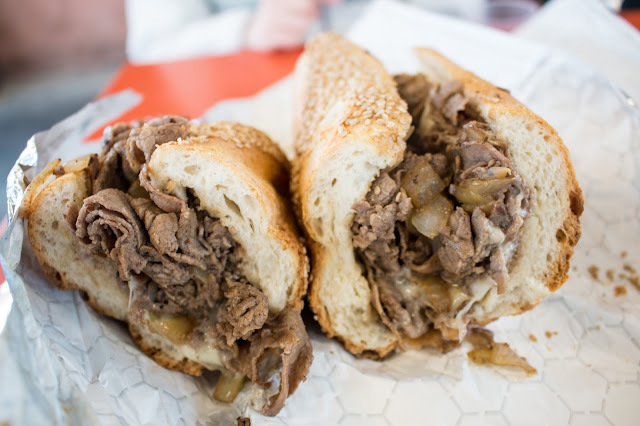 Regular readers know of my quest to search for a proper Philly cheese steak that will top my unbridled love for the offerings from Philly's Best (ironically located in Chicago!). Admittedly, my love for a Philly's Best cheese steak may simply be my nostalgia for late-night college eat. Regardless, I can count on one hand the number of Philly-based cheese steak joints that have impressed me. 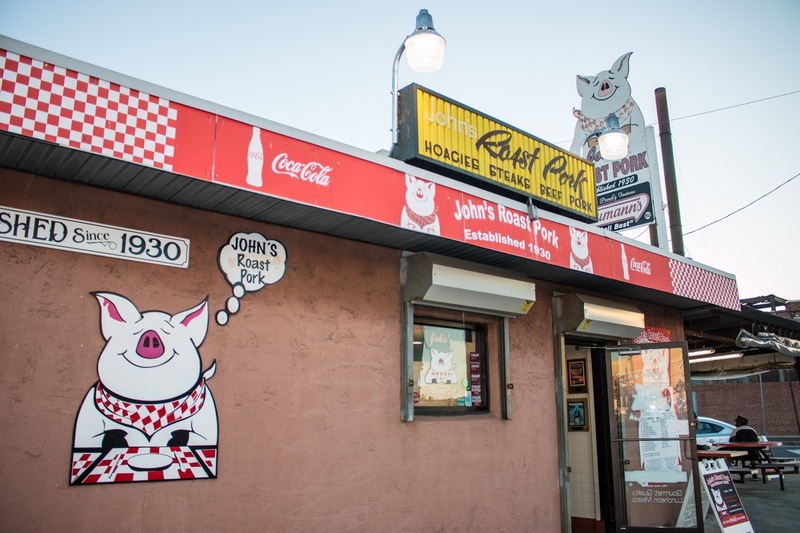 In my mind though, the one place that is at the top of cheese steak glory and trumps Philly's Best is South Philly stalwart, John's Roast Pork. Open for more than fifty years, John Bucci Jr. is proud of the fact that his sandwiches contain fewer, but higher quality ingredients. 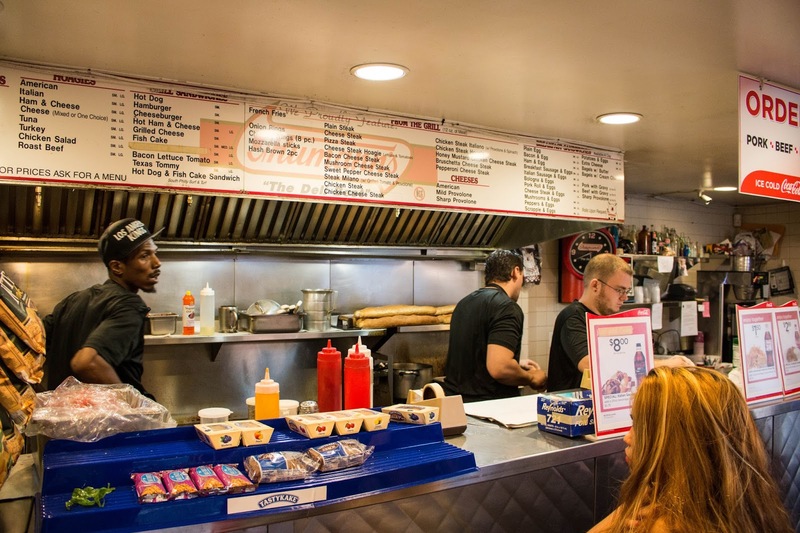 Should be no surprise that my recommendation for Philly's best cheese steak was awarded the James Beard Award for Culinary Excellence back in 2006! 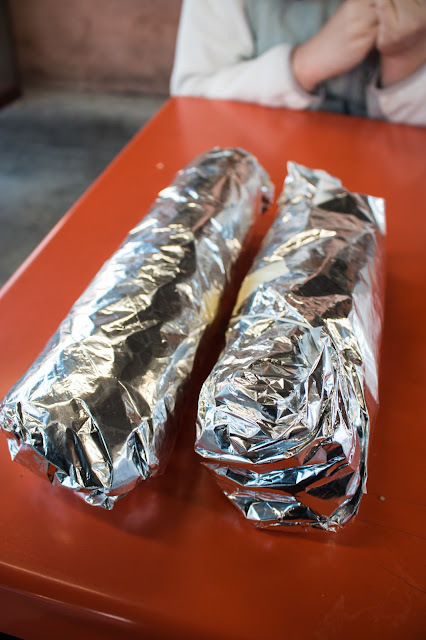 It's a small location, with just enough space to place your order at the cheese steak or roast pork stations. Once you pick up your order, there are tables outside to enjoy your sandwiches. On this particular visit, I ordered the foot long cheese steak (American cheese, 'wit) and had to try the large version of their eponymous sandwich, with sharp provolone and spinach. My large roast pork was definitely gargantuan. It was even larger than the foot long cheese steak! I loved that they use a seeded Carangi's roll here, which offers great texture on the outside and plenty of yeasty bread within to sop up the juice. The pork was juicy and well-seasoned, with the funky hit of sharp provolone making each bite for me. The spinach helped to balance out the richness, but a light sandwich this is not. 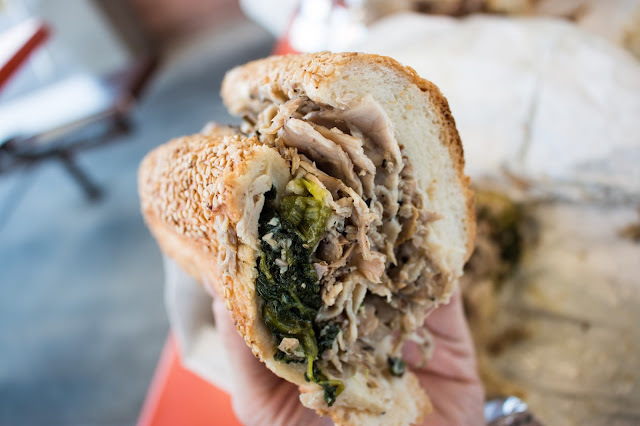 Admittedly, Dinic's is still my favorite roast pork sandwich, but more due to their garlicky broccoli rabe and the over-abundance of the sharp provolone featured on their roast pork sandwiches. But really, I was here for the cheese steak. And I was not disappointed. I can see why whiz isn't ever allowed here. It's not needed! I often feel the need to double up on American cheese and whiz on my cheese steaks because most places offer a dry sandwich without enough creaminess. Here, the meat was high quality and well-seasoned, with a proper mix of fried onions. But better yet, the copious amount of American cheese helped to create a creamy, yet meaty bite. Hands down my favorite for best in Philly. So if you're looking for a high-quality cheese steak, obviously stay away from Pat's and Geno's. Ishkabibble's and Jim's on South Street will set you right. But my recommendation. Take the extra trek down to South Philly by the Ikea on South Columbus and make sure to bring cash. You won't be disappointed!